Vitamins are a type of micronutrient – essential nutrients your body needs in very small amounts, but that are still important in a healthy, balanced diet. There are eight different B vitamins and each has a slightly different function and benefit to the body. B vitamins are water-soluble vitamins, which means they cannot be stored by the body and so need to be consumed every day. Because of these reasons, it’s important to include a variety of sources of each of the different B vitamins in your diet each day to ensure you’re giving your body what it needs. Let’s have a look at some of the key functions of B vitamins, and where you can find them in Isagenix products. Many B vitamins are required to help facilitate biological functions within the body, known as coenzymes. Thiamin (vitamin B1), riboflavin (vitamin B2), niacin (vitamin B3), pantothenic acid, vitamin B6, and vitamin B12 all act as coenzymes to help breakdown and release energy from the foods we eat. Vitamin B6 also allows the body to use and store energy from protein and carbohydrates provided by the foods we eat (1). Thiamin, riboflavin, niacin, and vitamin B12 all work to keep the nervous system healthy and functioning as it should. Ensuring you have sufficient intakes of niacin and riboflavin can also help to keep your skin healthy, and riboflavin can also help to keep your eyes healthy (1). Whilst good nutrition may sound easy, 13% of women in the UK have inadequate intakes of riboflavin (2). This means that over a period of time, more than one in 10 women are likely to have an insufficient supply of riboflavin to perform its essential function within the body. Folate, or folic acid, (sometimes referred to as vitamin B9) and vitamin B12 are both involved in the formation of red blood cells. The function of red blood cells is to transport oxygen around the body. The amount of red blood cells you have and how well they work will determine how much oxygen is delivered to your body’s tissues (3). When there is inadequate intake of vitamin B12, the body can’t make enough healthy red blood cells. With insufficient vitamin B12 the red blood cells can’t divide normally and are too large, and so they can be unable to get out of the bone marrow. The main function of red blood cells is to carry oxygen around the body, so when this process can’t happen effectively it may lead to feelings fatigue or weakness (1, 4). Folate also has an important role to play in cell division, and so is particularly important in pregnancy. If the body becomes deficient in folic acid, many key reactions and processes can’t occur, which can lead to problems such as megaloblastic anaemia and neural tube defects (1, 4). Research suggests riboflavin has a role to play in protecting the body against oxidative stress. Oxidative stress is when there is an increased generation of reactive oxygen species, or a reduced ability to deactivate them, and is involved in the development of many chronic diseases. One of the main factors involved in reducing oxidative stress is increasing the antioxidant potential. Studies have confirmed the antioxidant nature of riboflavin, which indicates that this vitamin can protect the body against oxidative stress (1, 5). IsaLeanTM Shake, our balanced meal replacement shake, provides 22 vitamins and minerals. In each shake, you can be sure you’re getting at least 30% of the recommended intake of thiamin, riboflavin, niacin, vitamin B6, folic acid, vitamin B12, and pantothenic acid. In addition to that, Ionix® Supreme is also a source of niacin, thiamin, riboflavin, vitamin B6, and vitamin B12. You’ll also find niacin, vitamin B6, and vitamin B12 in Nourish for LifeTM. 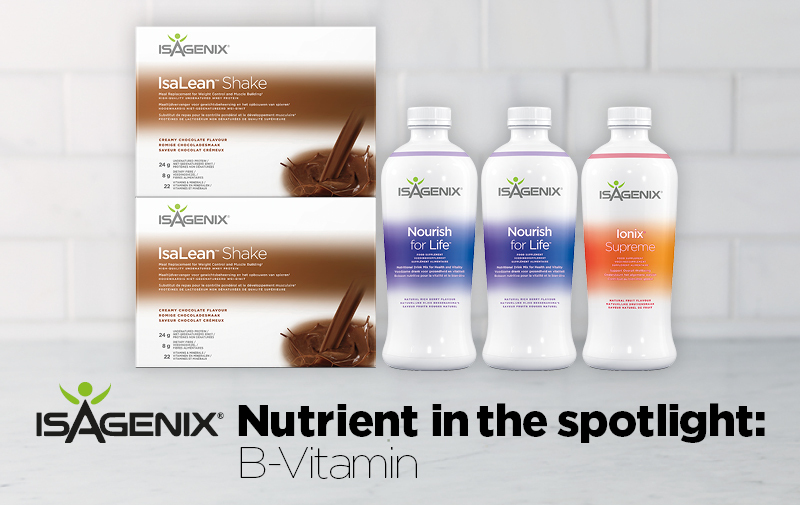 Isagenix products and systems are nutrient-dense, nutritionally balanced solutions that provide balanced macronutrients as well as the essential vitamins and minerals.